Since 1958, Jonathan Schwartz has been somewhere on your radio dial. 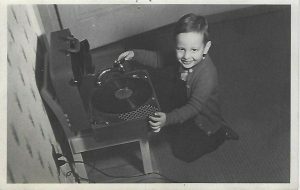 In fact, even at a very young age, he was the master of the Victrola, back announcing the records of the day to his neighbors via a baby monitor. Maybe you listened to him on 102.7 WNEW-FM or WNEW 1130 or later at WQEW. Perhaps you subscribed to Sirius/XM or pledged money to public radio to listen to the great music and the stories that only Jonathan can tell. Bottom line? You’ve missed hearing Jonathan on your radio or digital device playing and discussing The American Songbook not to mention the artists. Well, we’ve heard you and are happy to say: Jonno is back. Welcome to The Jonathan Station. David Hinckley, long time writer at The New York Daily News, just penned a nice article for Medium about The Jonathan Station – Jonathan Schwartz: Fired at 79 1/2, Back in Business at 80. Music, Maestro, Please. Joe Brancatelli, long time WNEW and JS fan, added a new post to his blog for business travelers about his experiences and the return of Jonathan Schwartz entitled A Stowaway in the Sky Returns to the Air. To be compliant with the various music performance organizations, we had to drop our music player and require you to click on the “Play Now!” button to listen to the stream. While we have no input on the design of the player page, it does offer links to Amazon from the “Just Played” list and we have also now added the album name to the artist – song title. The Jonathan Station also streams live on Radionomy.com. and listen on your phone or tablet. is not available in the App Store. This is an archive of past live shows as heard on The Jonathan Station. Sunday Show 04-14-2019 – We take a rest from raiding the tape box and present a solid three hours and five minutes of live Jonno. 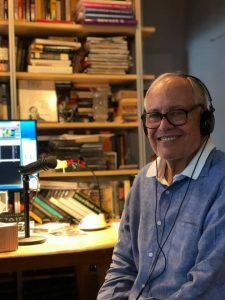 Saturday Show 04-13-2019 – Another great show filled with music and a special hour recording of Arthur Schwartz performing for an audience at The American Embassy in London in 1976 that Jonathan had never heard before. Sunday Show 04-07-2019 – Jonathan continues with his harvest of classic interviews and shows with a celebration of the birthday of an old friend, Jimmy Van Heusen on January 25, 1981. Saturday Show 04-06-2019 – Jonathan celebrates the 97th birthday of Doris Day by remembering the phone call he got from her on the air in 2010. Sunday Show 03-31-2019 – We close out the month of March with a lot of great music plus we unearth Jonno’s interview with Lena Horne from January 3, 1981 on WNEW 1130. Saturday Show 03-30-2019 – A great show made even better with the addition of Jonathan’s discussion with Mel Torme’ on WNEW 1130 back in September 1988. Sunday Show 03-24-2019 – A celebration of Stephen Sondheim’s 89th birthday and more. Saturday Show 03-23-2019 – JS is back and feeling better with lots of songs to play! Sunday Show 03-17-2019 – Jonno calls in sick so we repeated his Salute To Baseball show from Super Bowl weekend. Saturday Show 03-16-2019 – Jonathan declares that it’s Spring (or at least close) and plays some Sinatra sessions. Sunday Show 03-10-2019 – It’s a rainy day in New York and time has sprung forward. Saturday Show 03-09-2019 – Saturday with stories from Jonathan and music from The Songbook. Sunday Show 03-03-2019 – Another Sunday afternoon filled with The American Songbook and stories from Jonathan. Saturday Show 03-02-2019 – First show of March comes in like a lion with a great Saturday of music. Sunday Show 02-24-2019 – The weekend continues and so does Jonno’s playing through his mountain of CDs. Saturday Show 02-23-2019 – Saturday in New York and Jonathan is sorting through stacks of CDs. Sunday Show 02-17-2019 – More of music touched by legendary arranger Nelson Riddle, the second part of Jonno’s interview plus much more. Saturday Show 02-16-2019 – Harold Arlen was born on February 15, 1905 and Jonathan spends much of this show playing music from the pen of Mr. Arlen and includes a few songs performed by the composer himself. Jonathan plays the first part of an interview he did with Nelson Riddle back in September 1982 while at WNEW1130. Sunday Show 02-10-2019 – When Sinatra launched Reprise Records after leaving Capitol, he had to create the first album without Nelson Riddle. Riddle was held up due to his contract with Capitol, so Johnny Mandel was brought in to arrange the ‘Ring-A-Ding’ LP. We listen to some of those sessions and much more. Saturday Show 02-09-2019 – A great afternoon of music with a rare Sinatra salute to Cole Porter. Sunday Show 02-03-2019 – It’s Super Bowl Sunday and that means it’s time for Jonathan’s “Salute To Baseball” – an annual tradition since 1971. Sunday Show 01-27-2018 – Jonno continues his search through rare Sinatra tracks and much more. Saturday Show 01-26-2019 – It was a cold, cold day in New York City and Jonathan decided to spend the show digging out Sinatra rarities. Sunday Show 01-20-2019 – Jonno decides to make the weekly Sunday show three hours long. A really good three hour show that is now repeated later in the evening.Enjoy! Saturday Show 01-19-2019 – Back after a few weeks off, Jonathan settles in for a new three hour collection of music and stories. Christmas Show 12-22-2018 Late Show – Another wonderful show continuing a 46 year tradition started by Jonathan Schwartz in 1971. Tierney Sutton and Kate McGarry present more special guests and a different playlist rounding out two days of holiday shows at Birdland Theatre in NYC. Christmas Show 12-21-2018 Late Show – An amazing show starring Tierney Sutton and Kate McGarry and a lot of special guests. Among the guests on this show is the legendary Freddy Cole who stopped down between sets upstairs. Saturday Show 12-15-2018 – After identifying his opening theme for the first time, Jonathan remembers Nancy Wilson. He also includes Nancy LaMott’s unique take on a certain Frank Loesser’s 1944 song. He celebrates the arrival back in 1959 of Dave Brubeck’s historic album ‘Time Out’, the first jazz album to sell one million copies. All that in the first hour of the show. Enjoy! Sunday Show 12-09-2018 – The show started as it always does at Noon. Jonathan started this one by declaring that he was focused on presenting The American Songbook with the hope that future generations will at least give it a listen and perhaps appreciate it as the quality product we do. He explained that because of that focus, he had removed much of the jazz, rock and folk that he has played on other stations in the past. About two hours into the program, coming out of a couple of Peggy Lee records, he decided to “open the show a little…a lot in fact…” and brought back jazz records back into the mix. He started with Miles Davis from his 1960 ‘Sketches of Spain’ album. To answer your question, no it wasn’t planned. Enjoy. Saturday Show 12-08-2018 – On this Saturday, lots of music. Who are “they”? Talk of The Christmas shows and talk of hanging with Mel Torme’. Sunday Show 12-02-2018 – A rainy day in New York and we hear the story of “Here’s That Rainy Day”, written by Jimmy Van Heusen and Johnny Burke in 1953 but not brought to Sinatra until 1959 for use in the Capitol album ‘No One Cares’. Later, Jonathan tells the story about how Alan Jay Lerner wrote the title “I’ve Grown Accustomed to Her Face” using Pete McGuinness’s take as an example. Saturday Show 12-01-2018 – Jonathan starts off the month of December with various artists highlighted with multiple songs from each. Doris Day, Barbara Cook, Bobby Darin and Fred Astaire. He also mentions that his daughter, Casey, got married just the night before. Sunday Show 11-25-2018 – It’s Arthur Schwartz’s birthday! Rather than burn down the studio with 118 candles, Jonno plays a hour or more of music written and/or sung by his dad. Saturday Show 11-24-2018 – Story about having Johnny Hartman on Jonathan’s WNEW-TV show. While Hartman sang seven songs wonderfully, he was secretly dying of lung cancer. A sprinkling of Arthur songs on the eve of his 118th birthday and much more. Sunday Show 11-18-2018 – It’s Johnny Mercer’s birthday and Jonno plays songs Mercer wrote and sang. Did you know that Johnny Mercer wrote songs with 190 folks? Speaking of birthdays, we’re a week away from the birthday of Arthur Schwartz. Ahead of the day, a friend drops off recordings of Arthur that – while familiar – his son had never heard before. Saturday Show 11-17-2018 – New music from Pam Brennan’s ‘Moonglow’, Cyrille Aimée LIVE! and another listen to Melissa Errico’s new Sondheim Sublime plus a spotlight on the brothers George and Ira Gershwin. Lots of stories and a Sinatra Spectacular, too! Sunday Show 11-11-2018 – New music from Melissa Errico’s album ‘Sondheim Sublime’, Jason Robert Brown’s ‘How We React and How We Recover’ and Karrin Allyson’s ‘Some of That Sunshine’ is just part of a wonderful afternoon in New York. Plenty of stories plus a big block o’ Sinatra. Saturday Show 11-10-2018 – New music featured by Pam Brennan, Kate McGarry and Cyrille Aimee. Jonno decides to rummage through the TJS library for “New York” songs from Judy Garland, Mel Torme’, Peggy Lee, Tony Bennett with Billy Joel, Bobby Short, Rosemary Clooney, Jimmy Roselli, Diana Washington plus Jonathan himself and it’s capped off with an opposing viewpoint from John Pizzarelli. There’s a block of Sinatra and much more. Sunday Show 11-04-2018 – Music from Diana Panton wishing for Moonlight Saving Time starts this first show after we all fell back an hour in the States (except those in Arizona). Jonathan recounts his memory of being in the room while Harold Arlen and Yip Harburg wrote “Happiness is a Thing Called Joe”. He also recalls trying to figure out as a young boy what happens to the musicians when a song fades out on a record. Saturday Show 11-03-2018 – The beginning of November marks the beginning of The Saturday Show on TJS. Three hours of Jonno and The American Songbook tonight featuring a number of songs from the pen of Harold Arlen – some actually performed by the composer. At 9pm, we have a Sinatra Section and Jonathan discusses the upcoming Christmas shows at Birdland. Sunday Show 10-28-2018 – You want some Jonathan stories? We’ve got them! A recent listener email sent to Jonno expressed the thought “if Sinatra was alive, he’d kill you!” The Jonathan Station answer to our faux-fan comes from the library: An interview recorded by Bruce Jenkins, the son of arranger, Gordon Jenkins, with Frank Sinatra. While Bruce, a sports columnist for the San Francisco Chronicle, sat down with Sinatra looking for a slam of Jonathan, what he got was much different. Speaking of stories, did you know that Mel Torme’ once considered giving up singing to become an airline pilot? Go listen! Sunday Show 10-21-2018 – Discussion of the two teams about to go head to head in the World Series, rare cuts from Sinatra at Knokke Casino, Belgium, May 23, 1953 and mention of the recent death of Charles Aznavour start off the show. Part of this week’s Sinatra Spectacular spotlights the release of a remastered ‘Only The Lonely’ to mark the 60th anniversary of the record with some unique Jonathan insights. Jonno speaks of the upcoming Christmas Shows and much more. Sunday Show 10-14-2018 – “It’s Autumn. And isn’t it, though?” Jonno plays a Barbara Cook duet with Barry Manilow…and kinda liked it. He ponders the kismet of Nelson Riddle and Frank Sinatra coming to work at Capitol Records at the same time and the magic that happened because of it. Jonathan discovers a copy of “Something to Remember You By” as performed by the Nelson Riddle Orchestra. Listening to Nelson’s arrangement of one of Arthur Schwartz’s first songs reminds him of being in the room as his father was discussing with Capitol Records who would arrange ‘Magic Moments of The Gay Life’ in 1960. That full story and much more awaits you in this great four hour show. Sunday Show 10-7-2018 – What other disk jockey in New York would play “I’ll Be Home For Christmas” at the beginning of October? Nancy LaMott starts off the show. Also featured: Billie Holiday, Beverly Kenney and Stephen Sondheim. Jonathan spins a couple of cuts from the #1 Jazz album (and #11 on the overall Billboard Magazine chart) from Tony Bennett and Diana Krall. Eleven songs make up the Sinatra Spectacular this week plus there’s a revisit of Phil Roy’s song “Melt” and more! Sunday Show 9-23-2018 – Jonathan starts the first full day of Fall with four hours of music and a head cold on a rainy day in NYC. Discussion of the talent of singer Beverly Kenney and her tragic end. He references an article he wrote for GQ Magazine in 1992 and a listener sends him a link to it. The GQ Article on Beverly Kenney Lots of songs from Dietz & Schwartz (9!) Plus he explains why he didn’t play Bobby Darin until recently. Sunday Show 9-16-2018 – Just over four hours of Jonno. Featured on the show, we are reminded of the upcoming change of seasons with several artists doing Autumn Leaves. 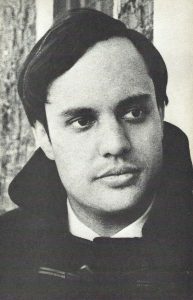 JS unearthed a recording that he first discovered at WNEW of Phil Roy singing his song “Melt”. He also plays a rare record (a Japanese reissue) from Bill Black. Jonathan hears for the first time, Hoagy Carmichael singing a rare song that Hoagy also wrote – “Winter Moon”. There’s a Sinatra Spectacular that clocks in at over 30 minutes and lots more. Sunday Show 9-9-2018 – Not available. Recording levels got bumped inadvertently before the show and the resulting recording is too hot and distorted. Sunday Show 9-2-2018 – It’s Labor Day Weekend (in the US) and the show starts as it has on this weekend since 1975 – with Aaron Copland’s “Quiet City”. Lots of Sondheim (including a quote from him regarding the dumbing down of the country and Broadway). Jonathan acknowledges the birthday of his daughter, Casey and adds that Red Sox announcer Ned Martin mentioned her birth on-air on this day in 1982. Lots more, so go listen! Sunday Show 8-26-2018 – After a week off due to noisy construction nearby, Jonathan is rested and ready for another four hour program. Nelson Riddle is featured starting with a rare 1967 BBC-TV special with Nelson and Matt Monro. Did you know that Trump told Jonno “I like your show” during the 1988 re-dedication ceremony of Wollman Rink in Central Park? Jonathan was there representing WNEW 1130. There’s a 15 song Sinatra Spectacular and much more! Sunday Show 8-12-2018 – Four hours of music and stories including Sinatra singing “When Your Lover Is Gone”, Jessica Molaskey performing “Stars And The Moon” from Songs for a New World, Jason Robert Brown’s first musical in 1995 followed briskly by new music by Brown’s new album ‘How we React and How We Recover’. Sunday Show 8-5-2018 – Four hours on a hot summer day. Jonathan plays his WNEW interview with conversation with Harold Arlen (recorded about a month before he died) in which he asked Arlen how he wrote some of his songs. He also tells the story about Arthur Schwartz walking behind Harold Arlen on Park Avenue whistling “Dancing in the Dark” to get his attention. Those stories and much more. Sunday Show 7-29-2018 – A four hour show on a beautiful Sunday. Lots of stories starting with Jonathan’s first meeting with Sinatra at Bennett Cerf’s place. He plays Jo Stafford’s version of “Haunted Heart” from 1948. Jonathan says this was the first recording of his father’s song. Did Jonno start a controversy just days before Tony Bennett’s 92nd birthday? Wednesday Show 7-25-2018 – A three hour show on a rainy Wednesday. First song of the show? Nancy LaMott – It Might As Well Be Spring “That is one of the best songs I think I’ve ever heard.” The question which of his songs was Arthur Schwartz’s favorite is answered. There’s a Sinatra Spectacular, of course and a behind-the-scenes moment from Jonathan’s TV show on WNEW-TV Channel 5. Sunday Show 7-22-2018 – A three hour show featuring a comparison of the 1937 Rodgers and Hart song “Where Or When” using various artists, Pops singing “You’re The Tops” and Johnny Mercer singing with various artists. Jonathan talks about that, in his opinion, the American Songbook is made up of 50 writers and 50 singers. Of course, there is The Sinatra Spectacular and much more. Sunday Show 7-8-2018 – A four hour show that includes some great first-person stories about Tony Bennett and Keely Smith, a trivia question on a Sinatra record for listeners plus both Harold Arlen and Johnny Mercer singing versions of one their own songs. Sunday Show 7-1-2018 – Jonathan starts the month of July with a Jerome Kern spectacular and much more in a three hour show. Sunday Show 6-24-2018 – Three hours of great music and Jonathan. Wednesday Show 6-20-2018 – Our thanks to Kenneth Hutchins for the assist on this recording. First Sunday Show 6-17-2018 – Jonno returns after a six month absence to take the microphone at his own radio station. Have a song you want us to play? Visit, discuss (and hopefully, like) us on Facebook.